(Nanowerk News) While modern computers have revolutionized information processing, the mammalian brain continues to reign supreme in tasks such as recognizing sounds or objects, reading handwriting, or predicting where food may be found based on both memory and environmental clues. This contrast in performance stems from the radically divergent physical structures and operating mechanisms of neuronal networks and digital circuits. Computers employ a microprocessor to rapidly perform simple, error-free calculations in a sequential fashion and store data in physically separate memory banks. In contrast, the brain comprises a vast network of neurons serving simultaneously as both information processors and memory units, resulting in comparatively slow and imprecise operations in a parallel or distributed manner. A look inside the ASN device reveals its highly interconnected architecture which comprises synaptic circuit elements at each point of contact between nanowires. The collective interactions between these atomic switches result in unique, emergent properties which have shown significant potential for neuromorphic computing. Most efforts to mimic brain function involve programming computers to create virtual neural networks. 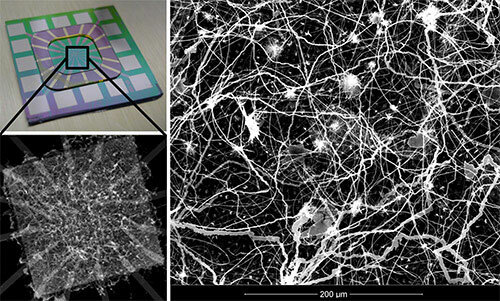 However, researchers at the California NanoSystems Institute (CNSI) at the University of California, Los Angeles (UCLA) and the International Center for Materials Nanoarchitectonics (MANA) at the National Institute for Materials Science, Japan are developing a neuromorphic device designed to incorporate structural aspects inspired by the cortical neuropil and produce the class of operational properties which underlie cognition in the mammalian brain. The atomic switch, a recently developed nanoscale circuit element, has been shown to possess synapse-like properties in a purely inorganic device. Using a nanoarchitectonic approach, millions of atomic switch elements are incorporated into a densely interconnected network of silver nanowires. These atomic switch networks (ASN) retain the synaptic properties of their of individual component elements and generate emergent behaviors comprised of their distributed, collective interactions. Such emergent behaviors are a principal characteristic of biological neural networks and many other complex systems. Ongoing studies involve the utilization of these emergent behaviors for information processing toward the generation of a new class of cognitive technologies. "Neuromorphic Atomic Switch Networks", A. V. Avizienis, H. O. Sillin, C. Martin-Olmo, H. H. Shieh, M. Aono, A. Z. Stieg and J. K. Gimzewski. PLoS One 7 (2012) e42772. "Self-organized Atomic Switch Networks", A. Z. Stieg, A. V. Avizienis, H. O. Sillin, C. Martin-Olmos, M. Aono and J. K. Gimzewski. Jpn. J. Appl. Phys. 53 (2014) 01AA02.